Links are provided below for free and purchasable items. To purchase The Kairos in paperback or Kindle© format, visit the book's Amazon.com page. To purchase a hard-cover copy, request cost and ordering instructions by email. Audio books (read by the author) will be available soon. You may email a request to be notified of cost and estimated date of availability. 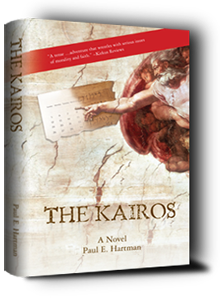 A free Kairos bookmark, personally inscribed, is available if you've purchased the book. Please send this email request, including the name you want it inscribed to and the mailing address. Thanks again for visiting CarpeKairos.com.